Paradox are a German thrash metal band that was formed in Würzburg in 1986. They signed to Roadrunner records who released their first two albums (Product of imagination & Heresy) before the band split or went inactive for ten years. After a comeback show at the Wacken Open Air festival in 1999, they signed with AFM records and have released three albums with them (Collision course, Electrify & Riot squad). Now the band are back with their fourth album for AFM (their 6th album overall), "Paradox". Germany has a record of producing world class thrash bands, with Sodom and Kreator being two of the biggest and best known, but I must admit that Paradox are a band I hadn't come across before. Having listened to this album far too many times I'm amazed I hadn't heard them before - this is some really excellent thrash metal. The album is fast and heavy with pounding high speed drumming, great heavy guitar riffs coupled with some excellent solos, the bass is more audible than on many band's albums and works very well, and the vocals are great - perfectly matched to the music. 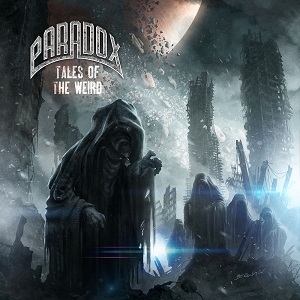 If you're a fan of German thrash metal then "Tales of the weird" is an album you should definitely check out.